Kitchener-Waterloo is already well established as a bastion of innovation. It's already actively adding places where people will want to live, work and play -- the three elements that define a cluster in a place of innovation. Toronto, on the other hand, has yet to truly establish a centralized, cohesive community where technological innovation can flourish. "One of the greatest things that Kitchener-Waterloo has done, better than any other city in the country, is create a cluster." John Ruffolo is pacing the floor at Toronto's OneEleven, a 15,000-square-foot co-working space that opened this week one block north of the city's financial district. The CEO of OMERS Ventures, Ruffolo is in his element as he unfurls a bold vision for the Kitchener-Waterloo/Greater Toronto Area: The time is now, he tells the crowd of 170, to stop thinking of the region as a pair of separately-functioning communities. If the nation's innovation sector is ever to realize its full potential, he declares, the Highway 401 corridor must be actively transformed into a technology "supercluster." Ever heard of the Silicon Valley? Good, then you're already familiar with the concept. The innovators and entrepreneurs seated in front of Ruffolo shift in their seats as he drives home the idea that -- no pressure -- the very future of the Canadian economy may well rest on their scrawny shoulders. Fifty to 60 percent of the country's innovation activity occurs in the corridor between Toronto and the Waterloo Region, he continues. Canada's economic engine, investment community and largest corporations are all headquartered in the GTA. If a national innovation strategy is to succeed anywhere in The Great White North, it must start here. "When you go to Kitchener-Waterloo and you say, 'Where do I go to see innovation?' you'd say, 'Go to Communitech, and if you have time, go to the accelerator centre, and if you have time, go to Velocity.' There's an answer. Say the same thing in Toronto, and you say, 'Well, let me think about this for a moment.'" That disconnect, Ruffolo continues, is the first challenge. Toronto, he tells the crowd, needs to be as immediately recognizable for its innovation community as Waterloo. That's one of the reasons that OMERS and the Ontario Centres for Excellence have created the OneEleven, a place intended to function as Ground Zero for the Toronto tech community. (Not coincidentally, it's located in the same Richmond Street West building as Google and Aeroplan's loyalty program data aggregator, Aimia.) More to the point, to thrive economically, and become an efficient tech supercluster, the region needs to combine its strengths and present itself as a single, contiguous innovation sector, not two distinct hubs. "Anecdotally, I view Kitchener-Waterloo like San Jose, and Toronto kind of like San Francisco," Ruffolo tells the crowd. "But instead of being connected by Highway 101, it's Highway 401. Maybe that's where the comparisons stop, but if you believe in the clustering theory, as we do, if you get two ends of that node extremely strong and then you develop the infrastructure between those two nodes, other parts of the ecosystem, like a hub and spoke, will start to really develop." Judging by the enthusiastic applause that erupts when Ruffolo surrenders the mic, the crowd at the aptly named Series 401 company showcase seems sold. But how does that desolate stretch of highway actually get transformed into a high-functioning technology supercluster? Geographically, the Toronto-KW corridor is startlingly similar to its Californian cousin, the Silicon Valley. The distance between the primary nodes, or cities, is eerily similar: San Francisco to San Jose is about 80 kilometres. Toronto to Waterloo? Roughly 95. The international airports - Pearson and San Francisco - are positioned at almost the exact same spot in relation to the regions' major cities. Trains run through both corridors, although their relative efficiencies are miles apart. As Steve Woods, Google Canada's senior engineering director puts it: "There are some trains. They don't run on good schedules, and any attempts to get them fixed have been very complicated. But even those trains, they go like three miles an hour when they go through Guelph because they go down a city street. You know there's problems that should be dealt with to make [the region] more effective as a cluster." The Silicon Valley/Bay Area employs roughly 380,000 tech workers; the Toronto-KW corridor has nearly 280,000. Each region has some of tech's biggest players - Electronic Arts, Oracle, Facebook and Google call Silicon Valley home; Google, Electronic Arts, Square and SAP hang their hat in the Waterloo Region. 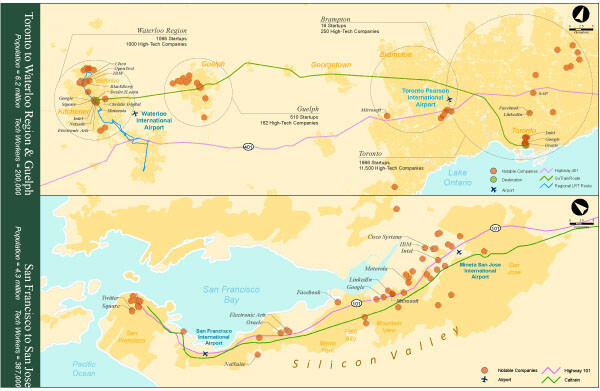 But when you look at the two areas on a map, a glaring discrepancy arises: From San Francisco to San Jose, the entire Silicon Valley corridor has been filled in by suburban development, with major tech players dotted all along the corridor. On paper and in person, it's seemingly a single region, and in many ways, it functions as such. The corridor from Toronto to Waterloo, on the other hand, is separated by long stretches of undeveloped farmland with tech innovation really only occurring at either end of the corridor. It feels like two distinct communities, with no connective tissue in between. Strengthen the nodes, say cluster theorists, and that middle ground will fill itself in. As Ruffolo outlined at One Eleven, before a pair of clusters can become a supercluster, with all of the necessary linkage infrastructure -- think transportation, data centres, buildings, homes, etc. -- each node must become strong in its own right. With nearly 1,000 companies big and small huddled around Communitech and contributing some $30-billion annually to the economy, Kitchener-Waterloo is already well established as a bastion of innovation. Sure, in terms of core infrastructure and development it still has room to grow, but it's already actively adding places where people will want to live, work and play -- the three elements that define a cluster in a place of innovation. Toronto, on the other hand, has yet to truly establish a centralized, cohesive community where technological innovation can flourish. "There is far more innovation going on [in Toronto], but the clustering is highly fragmented," Ruffolo told me. "It's going on in various parts of the GTA, right from Markham all the way to Oakville. And one of the problems here is, where do you connect that node into? When you try to observe, 'Where is that same intersection where you live, work and play?' it points to downtown Toronto, which is unfortunately quite expensive." The OMERS solution? Plant the Tech City flag in the downtown core, offer thoughtfully-curated innovators a break on rent, and let the clustering commence. Bilal Khan, managing director of OneEleven, is sitting in one of the hub's glass-walled conference rooms when I ask him to elaborate on that vision. "OneEleven is here not only to solve that [fragmentation] problem within the Toronto area - to let people know that there's a place to go, that's there's a home for tech that's right in the heart of downtown Toronto - but more importantly to be able to link and have a kind of free flow of movement between what's going on in Kitchener-Waterloo and what's going on here in Toronto." The endgame isn't parochial - it's focused on regional success. Back at the Series 401 company showcase, Hongwei Liu is in demand. As one of 16 presenters that delivered a four-minute pitch today, the CEO and co-founder of MappedIn is now manning a booth, demonstrating to prospective investors how his company's indoor mapping software works. Being able to present in Toronto is a coup for the Kitchener-Waterloo entrepreneur, one of the perks of being invited to the One Eleven's showcase, which is designed to help facilitate networking between Toronto's investment and tech community and the innovators from down the 401. "Product development in Waterloo is cheap, " Liu says. "Events are cheap, the cost of living is cheap, and it's where all the smart people are coming out of university. But for business, fundraising or for that next step, Toronto is where you have to be." That's a primary reason why entrepreneurs such as Ali Ghafour, founder and CTO of Viafoura, a cloud-based social conversation platform, have put down roots in Toronto's core. "A lot of the companies that we deal with - media companies, publishers, broadcasters and brands - have homes downtown. CBC, for example, is one of our clients, and Bell." Overcoming the entry cost to the core wasn't easy, admits Ghafour, but it was facilitated in part by the network of incubators and accelerators functioning within the supercluster region. "Viafoura is a MaRS client and were part of the DMZ [Ryerson's Digital Media Zone], and a part of Communitech as well. We made a conscious effort to be in these networks because they each offered a unique value to us," he says. "Communitech gave us access to the Waterloo network, which also includes one of our angel funders, GTAN [Golden Triangel Angel Investors]. So it'd be fantastic if these incubators had [more] shared programs and logistics between each other." The idea of collaboration isn't lost on Communitech's president and CEO, Iain Klugman. "Islands don't work well in this game. There is this kind of co-dependency that exists. San Francisco cannot be successful without the brother down the road." The same can be said for the collaborative relationship between Toronto and Waterloo. In fact, the success of the supercluster theory depends on it.